Review | Parties are always fun. However, themed parties are even more fun. A costume ball is not just any old dance, whereas a beach party is a bit more than just a bit of bash. Dressing the Touran as an off-road vehicle, Volkswagen wants the CrossTouran to be more than just another family car. Has it succeeded? Volkswagen has gone the whole hog with the CrossTouran. Even a complete outsider can see immediately that the CrossTouran has a totally different appearance to an everyday Touran. This is all thanks to the all the extras: an adapted grille, roof rails, matte jet black bodywork, large bumpers, rear lights simmering behind smoked glass and the necessary chrome highlights. In its standard format, the CrossTouran has extraordinarily amazing Funplay 17-inch alloys. The rear tyres are a little bit wider than the front tyres, which gives the car a sportier feeling. 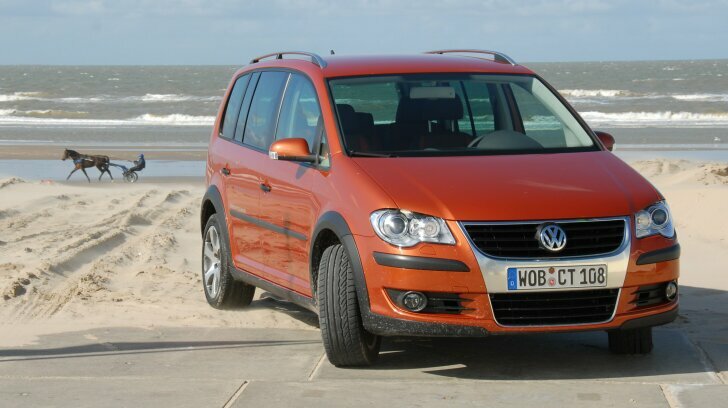 Volkswagen has created the colour Red Rock especially for the CrossTouran. It really suits. The CrossTouran has but one level of kit. This includes amongst other things cruise-control, air conditioning, radio/MP3/CD-player, front and rear electrical windows and flip tables in the backs of the front seats. Also standard are the electronic stability programme (ESP), traction control and front and rear airbags. It looks as though Halfords might have lost another valuable client in the CrossTouran driver. Just like the ordinary Touran, the CrossTouran is also a 7-seater. With a distinct lack of head and legroom, the second rear seat is really only designed for children. When all seven seats are occupied, there is zero luggage space (121 litres). 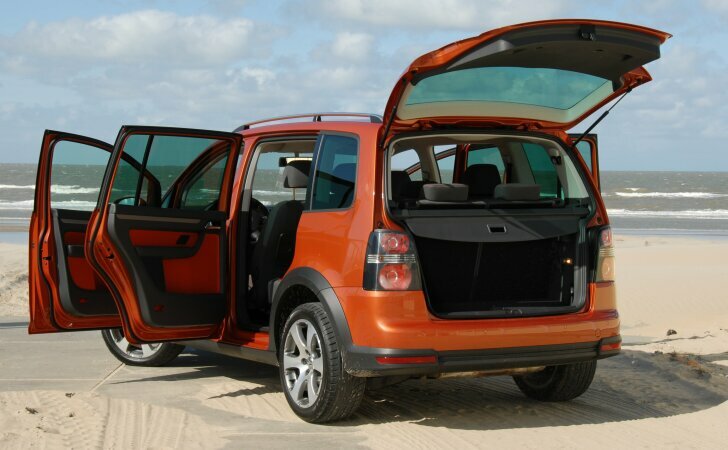 However, the second rear seat can be folded away, whereupon the CrossTouran has ample space for four adults and their luggage (695 litres). In reality, the Touran is mostly used as a spacious four-person car, with the second rear seat acting as an option. The unusual furnishing does actually work well. Although the CrossTouran drives exactly the same way as an ordinary Touran, it does feel that little bit more festive. The car does get the obvious stares which is pretty unusual for any MPV (Multi Purpose Vehicle). Even the seats in their sparkling orange Eclypt Elon feel even more fun to sit in than any ordinary grey seats. The only technical adaptation that has been made to convert the Touran into the CrossTouran is its raised chassis (12 mm). In spite of its promising appearance, the CrossTouran has no four-wheel drive. The increased ground clearance functions well in avoiding high pavement edges. The CrossTouran is delivered with three petrol and three diesel engines. The diesel engines all have a particle filter. They are 1.9 and 2.0 litres turbo diesels, which Volkswagen has been using for many a year in many of its cars. Every diesel engine is combined with a direct shift gearbox (DSG), which is fairly unusual. With regard to petrol engines, the CrossTouran has some very special technology. The starting model with its 1.6 litre four cylinder engine produces 102 hp. The other engines do have a smaller capacity, but nevertheless provide more power. With its TSI technology, Volkswagen combines the consumption of a small engine with the performances of a larger engine. The two strongest engines with their 1.4 litres are more than satisfactory. During this test drive, the strongest of these two ingenious engines was chosen. Combined with a turbo and a compressor, a very immodest 170 hp was conjured up out of this modest engine. The CrossTouran is no longer just a family van; it is a very quick one as well. At traffic lights, the CrossTouran moves away very smoothly, and even more so when the car is in DSG. Direct Shift Gear works as if there two gearboxes in the car. When the one gear is being used to transmit power from the engine to the wheels, the other is already choosing the next gear so that no time is lost when changing between gears. Once you've tried it, you'll never look back. Volkswagen is keen to point out that 25% of all its models now leaving its factories have DSG gearboxes. 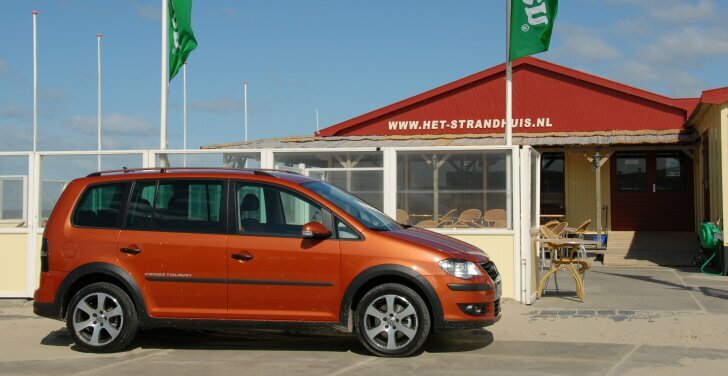 However it's not only in the city, but also on the motorway that the CrossTouran 1.4TSI is a lively car. On the motorway, the car knows how to achieve high speeds effortlessly and then to maintain them. Only on braking does the CrossTouran feel in any way heavy. The driving pleasure is completed by its exemplary road handling. For an MPV, the CrossTouran has a hard suspension, which results in a sportier but more importantly a safer road handling. In short: The Volkswagen Touran was already a good MPV, but with these additions the CrossTouran has turned into a very nice MPV. It's all show, but it does work. 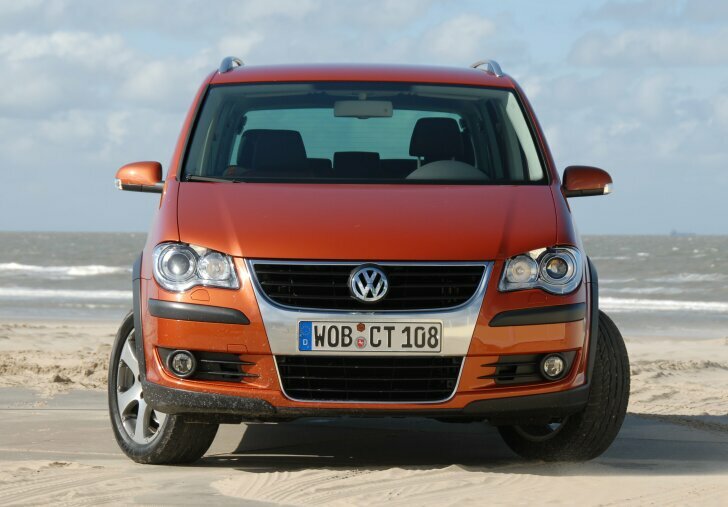 The CrossTouran drives like an ordinary Touran and has as much space as ordinary Touran. The equipment is a little bit fancier than usual. Moreover the CrossTouran offers innovative technology in the form of a fast and economical TSI engine with intelligent DSG gearbox. 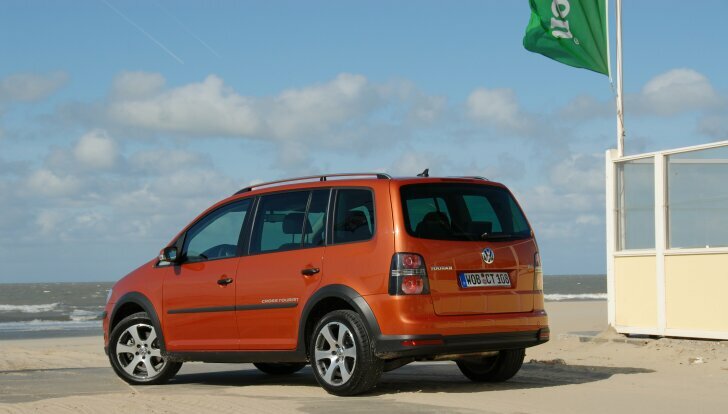 In the end, the adapted exterior makes an ordinary MPV into a jolly family car. "Too hip for the kids "